brings you the first chapter of Vandara's lore, the three great empires of Cidalac, Taurun, and New Estaria that shape struggle for Vandara's future supremacy, along with the great cities of Balyn and Maytar, whose industry and ideology are the fulcrums are at the heart of Vandara's many-sided conflicts. 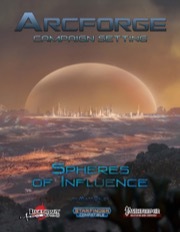 In addition, you'll find a wealth of character options for heroes and villains alike using the Pathfinder Roleplaying Game rules, like the mech-riding Arcforged Champion and Morphmech Renegade, and for the Starfinder Roleplaying Game like the Forgepriest technomancer and Machine Speaker envoy. Plus fans of the Spheres of Power and Spheres of Might rules will find tons of new material for those systems, including the world-shaking forces of the Technomancy sphere. The world of Vandara belongs to those who have the audacity to claim it. Grab this 48-page multi-system accessory today and Make Your Game Legendary! 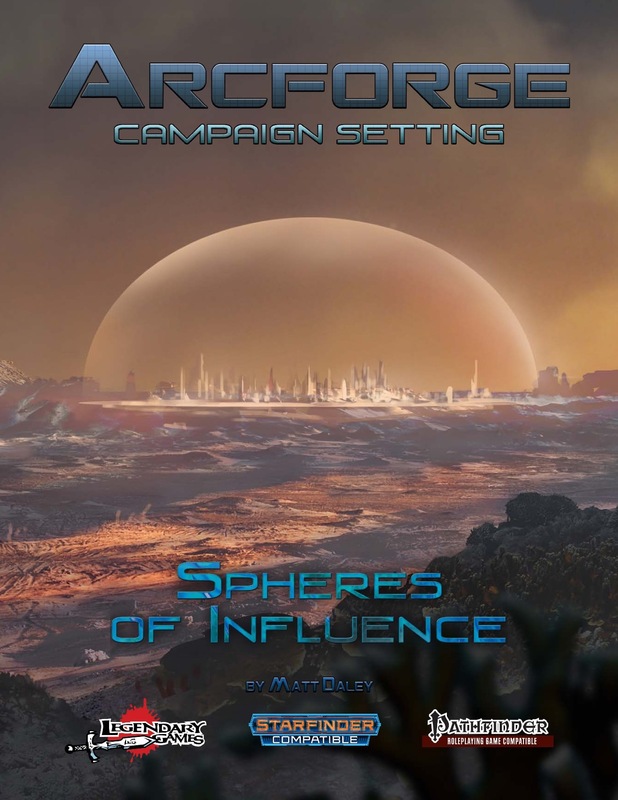 Now available, with rules for both Pathfinder and Starfinder campaigns! Glad this is finally out there. Original writer here for all of your questions. Ah yes, to the top of my wishlist with this. I've enjoyed the previous books in this series and I like SoP and SoM, so that's a no brainer. But since you're open to questions, how about a short rundown of the SoM love in this book? Talents, archetypes, feats? It's not a huge part, honestly. Spheres of power gets love in the form of the Technomancy Sphere, a bunch of new Armorist options, and a new Symbiat archetype. The big thing for Spheres of Might is the bevy of new martial traditions in the book, each tying into a major locale in Vandara. If you want more Spheres of Might stuff down the road, please let us know. But yes, I think you folks might want to consider expanding on the Spheres of Might material. The first thing that springs to mind, or at least my mind, is how combat techniques change with the setting. Outlaw weapons, and people start playing hardball with farming implements and bare hands and feet, etc. So in a high tech setting like Starfinder there ought to be warriors taking advantage of their high tech weaponry and doing stuff with their monomolecular whips or jet powered knives that either wouldn't be possible or practical with lower tech weaponry. How about a Armiger who keeps tinkering with personal bit of power armor? Or a Commander of robots for something similar to the helmsman? Or a Helmsman who channels his combat talents through his mecha? Or throw in some Champions material, like say a magic swordsman with a plasma sword, for example. So I think there's definitely an unexplored niche there. Lots of room to expand and try out new things. Glad you're excited to see it. The next Arcforge book should be heading to layout in another week or two, with more fun rules stuff and more Vandara world lore! You're running out of subsystems I know are popular. Not that I'd say no to a book of high tech Pact Magic. High tech spacefaring cultures ought to have plenty of material there. Incidentally, for anyone who's curious, the new magic sphere in this book is especially relevant for games with lots of constructs or technology - either on the enemy's side or your own. So, like, Iron Gods, probably Legendary Planet Adventure Path, and so on.